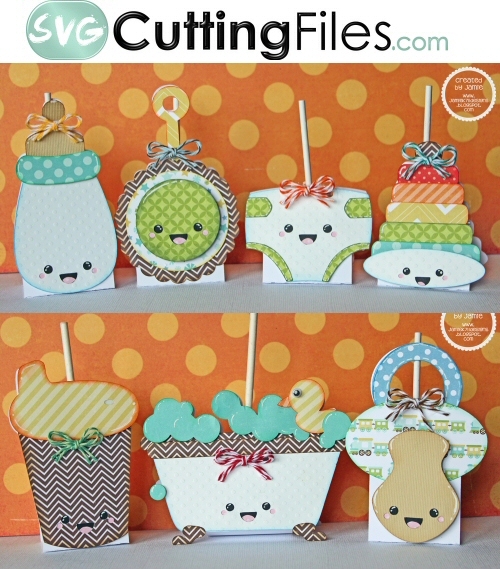 Kawaii Baby Things Lollipop Covers SVG Cutting File. Arent these the CUTEST ever... you get all the covers you see to hold a standard lollipop. You get the pacifier, bottle, rattle, stacking toy, diaper, sippy cup, bath tub -- yes taht is SEVEN baby themed Lollipop covers!! Just hole punch for your tie on ribbon!